The January, 1964 Gazette printed the following News Release from SCCA headquarters. 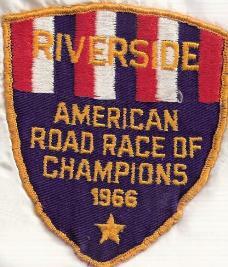 It began 50 years of "the Runoffs." Paul Fortner reported from the 1974 ARRC in Atlanta for the December, 1974 Gazette. The Slide Shows are from several Gazettes, personal photographs and Sharon McBride. The cooperative agreement for this first event of its kind has just been reached between the Sports Car Club of America (SCCA) and the organizers. The massive program, expected to attract as many as 400 competitors, will be sanctioned by SCCA, conducted by the California Sports Car Club Region of SCCA, sponsored by Sports Car Graphic magazine, and promoted by Riverside International Raceway. 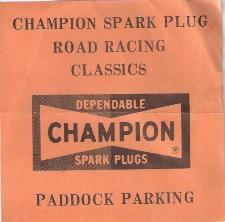 It is planned that a similar interdivisional championship event will take place each year at sites to be determined by SCCA. Production category, classes A through H; Modified category, C through H; Formula Junior; Formula Vee; Formula Libre. From each division’s series, the top six finishers in each class will be invited to file an entry in the November “American Road Race of Champions.” A maximum of 36 entries per class will be accepted. Every entrant will recieve a free double-room for four nights in Riverside as guests of the sponsors. At least one party, three dinners, and one lunch will be provided free of charge for each entrant plus one guest. Working garage space and mechanical assistance will be available at no charge. There will be no entry fees for the event. In addition, SCCA will administer a fund to be used solely for the reimbursement of a portion of the travel expenses incurred by the first three finishers in each divisional class in attending the Riverside event. 1. 1967 Thanksgiving Dinner at Daytona pits cafeteria. l to r: Sandra Saucier, Dave Dooley, Elouise Norris, Mike Dickey, John Saucier. 2. 1968 Riverside, Doc Foerster, Datsun 2000, Riverside Turn Six. 3. 1968, Riverside, Dave Dooley, Sunray DX Corvette, Turn Seven. 4. 1968, Riverside, Gene Rolfe and John Saucier prep Elouise Norris’ Mini. 5. 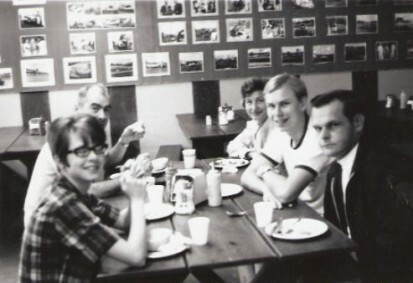 1968, Riverside, George England’s Volvo 544 crew, l to r: Russell Arterburn, Steve England, Judy Smith, George Smith, Margaret England, George England. 6. 1969, Daytona, George England Volvo P1800 on the banking. 7. 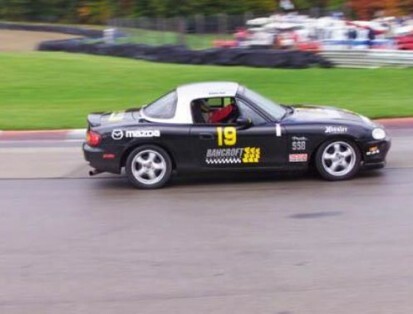 2013 Jack Donnellan, from Chickasha, took 6th in S2000. Only one short day in Oklahoma City after coming back from Las Vegas and off the following day to pick up Lon and Joyce McKinstry for the 13th trip to Atlanta, including “Toly's decade of shame”, We arrived at Road Atlanta Thursday afternoon after spending the night in Tuscaloosa Alabama. . had a beer and unloaded, setting up at gate 11, our favorite spot. It rained in the Chestnut Mountain area early in the week, washing out some of the paid practice sessions, so the practice continued on through Saturday. Spent the day keeping lap times for Alan Sevadjian and T.J. Chalmers from Dallas who finished 3rd and 9th respectively, in GTI. 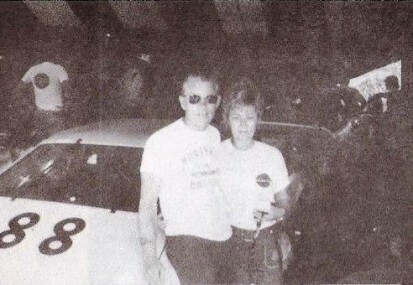 1, 1974, Road Atlanta, Paul and Jimmy Fortner in front of Paul’s Datsun 1200. 3. 1974, Road Atlanta, l to r; Jim Sayers, Suzanne Sayers, John Saucier and Sandra Saucier with John’s Zeitler Super Vee. 4. 1974, Road Atlanta, Dooley Engineering GT6 crew: l to r; Bobby Carter, Dave Dooley, Jim Hawkins, unidentified, Jerry Maxwell, Elouise Norris. 5. 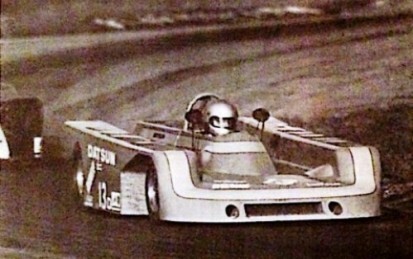 1974, Road Atlanta, Bower Brothers DSR Jabro. On left, Walt Bower, right Larry Bower. Monday, we left for Orlando, Fla. to look at a Camel GT car for Daytona. Spent Monday and Tuesday taking pictures and talking to the owners about the 24 hour race at Daytona in February. Wednesday we arrived back at the Road Atlanta track in the early morning in time for Lon’s qualifying session, only to discover a rod bearing had gone, so we spent Wednesday afternoon changing engines. Wed night we made a trip to the “swamp” Cajun party, having gumbo and rice and beer. If you’ve never been there, you’ve missed the whole idea of what it’s all about, Friends! They are the good ole boys and gals! Thursday: Qualifying for Lon at 5. He qualified in the middle of the pack, no problems — we were happy with that and had another beer. Watched Yeager, Max Herrera, and Jack Beck qualify, then it was back to the swamp again for Max and Nancy Herrera’s Weiner roast.. .had been invited before this but this was the first time we had made it, Enjoyed seeing everyone. Some of the Tulsa group that was in Vegas were there. Friday was bright and clear for race day. DS racing was race one. (Duck, we missed you. They were turning 28 and change.) Larry Bower had problems when the flag dropped, finishing 17th. In the Vee race, Noble spun, and George Fizell won, and Zan Smith finished third. HP race - Canfield a bride’s maid again. Ray Yergler did a fine job of finishing third. SSB: Maybe I missed something, but the “PRESIDENT’S CUP” for a new car that won the race, loaded up, and put a for sale sign on it ? CSR: McKenna screwed up - underweight. Lon finished 11th, doing a good job. Champagne time! You would have thouqht we had won the race with our old 1600 BMW engine. Ate at the Georgiana Restaurant, which, by the way, is a good place to eat. 1. 1983, Road Atlanta, Larry Bower’s Lola DSR. 2. 1987, Road Atlanta, Walt Bower Puegeot 505 on the track. 3. 1987, Road Atlanta, Walt Bower Puegeot 505 on the roof. Saturday morning - GT3. I thought Richard Allen had the high dollars caught, running first in his group, until he lost a freeze plug. FF: A lot of good cars torn up. They were stacking them up by gate 3 like cordwood, Tray Jorski had his baptism of fire in the Ford race. FP: I thought we had a winner. Max Herrera qualified 6th and changed engines Friday night. During Saturdav morning warmup it was apparent he had made the right move. We had missed Ray Yergler in the winners circle ... box told us that he was there to win and we had better be in the winner’s circle with his cap. He moved from 6th to 3d, just bidding his time, only to have a rocker arm adjusting screw come loose, . . He had the fastest lap time during the race before disaster… Next year Max. GT5: Doug Peterson and the LeCar were outstanding for the 2d year in a row, qualifying on the pole and running away from the pack. The SRI race was a Datsun parade ending the day’s racing. Saturday night we had reservations for 22 at the “Landing” - seafood buffet - all you can eat - try it the next time you’re in the area, its good ! Sunday was a rainy day, fine mist for SSGT racing; Izzy Sanchez lead every lap in his Datsun with Jerry Hansen moving up to take second. GT1: After a false start, P.L. Newman jumped to a 2 second lead over Bethke who had a 2 second lead on Jerry Hansen. On the back side, Newman got blocked by a slower car, Bethke caught up and they collided in Turn 7 sending both to the pits. Then “like CART’, the officials screwed up what could have been a good race. Enough said except that Alan Sevadjian drove a good race finishing 3d and Kent Sawatzky from Weatherford finished 12th. GT2 - I would like to see Jim Fitzgerald at the Fair Grounds.., he knows how to “Hook’em up”. I thought turn 1 was going to be the end of the race, Fitz and Hogdal’s 2d Place qualifying Mazda hooked up fender to fender with fiber glass flying all the way up the hill. Reed came by in 1st, Fitz 2d and the Mazda went to the pits. Fitz’s tires went away moving him back to 4th. Morris Clement finished 3d and Don Reynolds finished 9th. The only race in DP was when Tom Kraft moved from 20th to 5th place only to have his shifter break and forcing him to settle for 14th place. 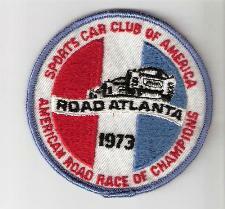 After 5 days at Caesar’s Palace and 11 days at Atlanta, the only things I see that could be improved on is the SCCA’s Spec. Car, the “President’s Cup”? and the appointed officials. 1. 2000, MidOhio, Randy Saucier on his way to the first of back to back SSC Championships. 2. 2011, Road America, John Saucier and Sandra Saucier on the grid for John’s last ARRC. From 1970 to 2011 John competed in 32 Runoffs.